In addition to our annual Rising Scholar Award, we look for ways to support our new generations of researchers, whether they are just starting school or are moving on to higher education. It is our hope that early exposure to the sciences will spark lifelong interests and enduring passions for conservation. MTI’s PTTs for Schools Program is part of our ongoing efforts to nourish a love for biology and ecological awareness in school-aged children by making our state-of-the-art transmitters freely available to them. We find that educating school children about conservation has a positive "ripple" effect in their communities as it promotes and propagates ecological awareness and removes misconceptions from the local populations about the species being studied when the students share their experiences with family and friends. 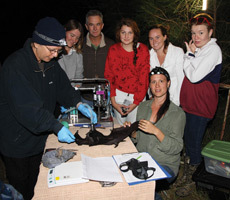 The students of Maclean High School (in association with the Office of Environment and Heritage and biologist Billie Roberts) received a specially modified version of our Solar 12g PTTs to track black flying-foxes. The children participated in trapping, measuring, and tagging the flying-foxes, and shared their knowldeg witht he community. The Ben Wyvis School (in association with the Royal Society for the Protection of Birds) received Solar Argos/GPS 22g PTTs to track Red Kites in the Scottish highlands. This experience helped both the children, as well as the wider community, to better understand the ecology of the Red Kites as well as what can be done to protect them. Students in Central Argentina worked with researchers to tag Crowned Eagle nestlings with Solar Argos/GPS 70g PTTs. The enthusiasm for these endangered birds from the students spread throughout the community and helped remove some of the negative misconceptions about the eagles. The students of the Island School in Eleuthera, The Bahamas received X-Tags to track Caribbean reef sharks. The Island School brings together students from the US, Canada, and The Bahamas to learn science and environmental education in a non-traditional class setting. Learn more about these projects in our Spring 2012, Winter 2012, and Spring 2013 Newsletters. School children from Erdenebulgan Sum in rural Mongolia received Solar Argos/GPS 70g PTTs to track Great Bustards in their region. These students (members of local "EcoClubs" organized by the Taimen Conservation Fund) had the opportunity to observe the bustards and receive a hands-on introduction to field research. The project promotes conservation among young researchers and elicits great enthusiasm from the locals. Project MAGO was created to connect students of the Box Elder School District in Utah, USA to Marbled Godwits. The children were introduced to the Marbled Godwit along with the "wonder of the wetlands" at the Bear River Migratory Bird Refuge. Afterwards, the participants were invited to participate in a MAGO essay contest for which the winners won the opportunity to name and help tag Marbled Godwits in the field. Read about these projects in our Winter 2007 and Spring 2008 Newsletters. Learn more about the results of these exciting projects in our Spring 2002, Winter 2002, and Spring 2003 Newsletters. Rob Paswaters, a Science Resource Specialist at Osceola County Florida, and his middle school students set out to track Great Blue Herons in Central Florida. Our company donated 3 satellite transmitters to their projects and were so impressed by the students' enthusiasm for the project that we began seeking more ways to allow young researchers worldwide to share in field research opportunities. 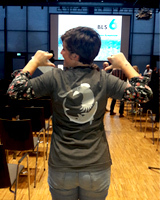 At our 2009 Bird and Fish Tracking Conference, we awarded scholarships to Sarah Trefry from the University of New Brunswick, Canada and Pascual Lopez from the University of Alicante, Spain. In 2001, we also awarded scholarships to two graduating seniors from local high schools who were planning to study biology in their higher education. Joseph Nuffer (Hammond High School, Columbia MD) and Lauren Wilde (Long Reach High School, Columbia, MD) were selected for their excellent academic achievements and involvement in the community. Joseph was headed for the University of Virginia with plans to study molecular biology, and Lauren was going to Wake Forest University to major in biology with a special interest in genetics. In celebration of our 25th anniversary, we sponsored promising students to attend several conferences around the world throughout 2017.